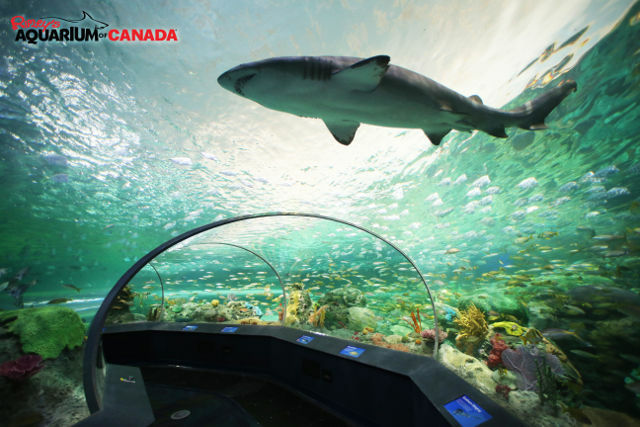 Ripley's Aquarium of Canada is a public aquarium in Toronto, Ontario, Canada. The aquarium is one of three aquariums owned and operated by Ripley Entertainment. It is located in downtown Toronto, just southeast of the CN Tower. The aquarium features several aquatic exhibits including a walk-through tank. The aquarium has 5.7 million litres (1.5 million gallons) of marine and freshwater habitats from across the world. The exhibits hold 13,500 exotic sea and freshwater specimens from more than 450 species. From the heart-pounding experience of Dangerous Lagoon, a football-field length glass viewing tunnel with moving glide-path sidewalk through sharks, green sea turtles, sawfish and moray eels; to the hypnotic dance of Pacific sea nettle jelly fish which illuminate an array of breathtaking colours from within the worlds largest kreisel tank at Planet Jellies, Ripleys Aquarium of Canada will captivate Torontonians as well as guests from around the world and is expected to draw over 2 million visitors per year. Open year round, 7 days a week. Tickets: see website. Save by purchasing timed tickets online. Easily accessible by car, but parking can be limited at times. See: map of nearby public parking areas. "288 Bremner Boulevard, Toronto, Ontario"